Dr. Scott MacRae is one of the most experienced and respected refractive surgeons in the world. He has more than 30 years of experience as a cornea specialist, more than 20 years of experience as a refractive surgeon, and has performed more than 20,000 refractive surgery procedures. He is the Director of Refractive Services in the Department of Ophthalmology at the University of Rochester where he is a Professor in Ophthalmology and a Professor of Visual Science at the University of Rochester's Center for Visual Science. 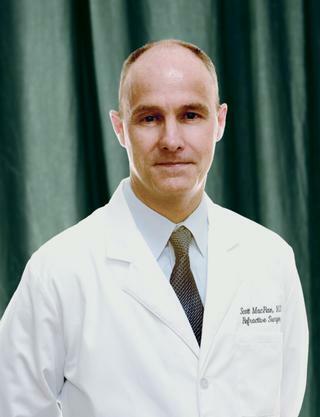 Dr. MacRae is an editorial board member on three refractive surgery journals and most recently was the Senior Associate Editor of the Journal of Refractive Surgery. He is a noted expert and widely published, including the Journal of Refractive Surgery, Popular Science, The New York Times, and various refractive surgery journals. He also co-authored the premier text on wavefront sensing, "Customized Corneal Ablation: The Quest for Super Vision," now out in its second volume, "Wavefront Customized Visual Correction: The Quest for Super Vision II." A board-certified ophthalmologist, Dr. MacRae is focused on patient safety and results. A leader in the refractive surgery field, Dr. MacRae has trained over 400 surgeons and has an extensive background in the development, safety, and effectiveness of laser vision correction technology. He has served as a member and consultant of the FDA's Ophthalmic Devices Panel, and was Chairman of the Public Health Committee with the American Academy of Ophthalmology. His work includes design of numerous refractive surgical instruments, laser surgery techniques and he holds the patent on a commonly used astigmatism treatment. Dr. MacRae also travels the world to lecture on laser vision correction, the prevention and treatment of complications. When other surgeons experience complications, they turn to Dr. MacRae. He was also named one of the "Top 50 Opinion Leaders in Cataract and Refractive Surgery" as voted by the readers of the professional journal Cataract and Refractive Surgery Today. Dr. MacRae studied at the University of Wisconsin and completed two cornea fellowships - at Medical College of Wisconsin and Emory University. After spending 16 years at Oregon Health Sciences University, Dr. MacRae joined the University of Rochester Department of Ophthalmology, where he is now a leader in the Alliance for Vision Excellence--a patient care and research collaboration between the University of Rochester and industry. The partnership brings together the most technologically advanced instruments, devices, and diagnostic tools to create optimal laser vision correction results for you. U.S. Patent Issued for Invention of Rochester Nomogram by Scott MacRae, MD and Manoj Venkiteshwar, Ph.D.
Zheleznyak L, Kim MJ, MacRae S, Yoon G. "Impact of corneal aberrations on through-focus image quality of presbyopia-correcting intraocular lenses using an adaptive optics bench system." Journal of cataract and refractive surgery.. 2012 Oct 0; 38(10):1724-33. Epub 2012 Aug 15. Cui L, Huxlin KR, Xu L, Macrae S, Knox WH. "High-resolution, noninvasive, two-photon fluorescence measurement of molecular concentrations in corneal tissue." Investigative ophthalmology & visual science.. 2011 Apr 0; 52(5):2556-64. Epub 2011 Apr 20. Bühren J, Yoon G, MacRae S, Huxlin K. "Contribution of optical zone decentration and pupil dilation on the change of optical quality after myopic photorefractive keratectomy in a cat model." Journal of refractive surgery.. 2010 Mar 0; 26(3):183-90. Epub 2010 Mar 11. Book Title: Wavefront Customized Visual Correction: The Quest for SuperVision II. Author List: Krueger, Ronald R.., Applegate, Raymond A., MacRae, S.M. Chapter Title: How Far Can We Extend the Limits of Human Vision? Author List: Williams, D.R., Porter, J., Yoon, G., Guirao, A., Hofer, H., Chen, L., Cox, I., MacRae, S.M.